I Sweden the launch of Xiaomi phones are still based on the fact that the 3 groups parent company CK Hutchison Holdings made a deal with the Chinese manufacturer to sell their phones in Europe. And whilst Xiaomi have started selling in Italy and France there's still no word on the Scandinavian release other than that it's coming. I purchased the Mix 2s from Gearbest [Affiliate Link] on a Sunday and it arrived with DHL on Thursday after lunch. I'd say that's pretty great. There are of course other ways. 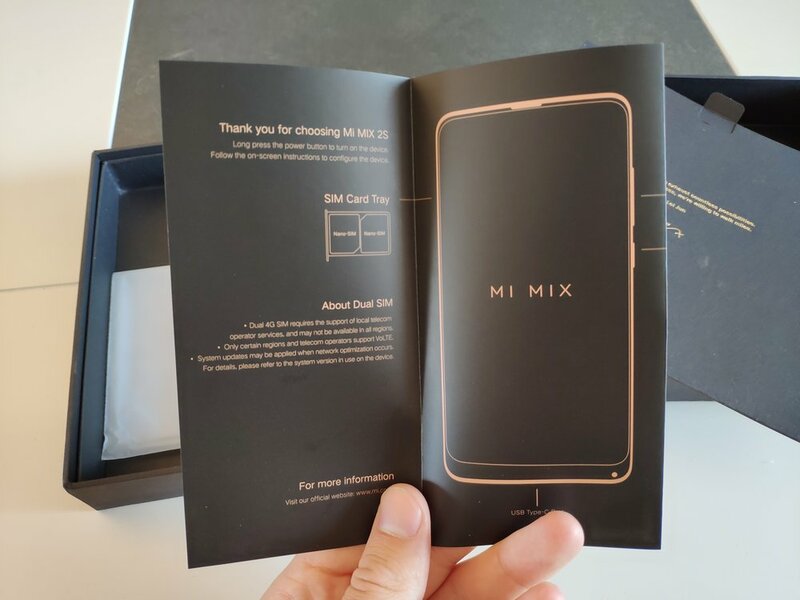 some Swedish retailers have started stocking up on some Xiaomi products, but they charge a fine fee for their part in importing them. On the other hands, if something were to happen it's easier to deal with a local store as opposed to one in China. There are also customs to be aware of when importing to the EU, but the price is still a lot better. Overall the process have been really fluid for me. Screen: 5.99-inch 2160x1080p Full-HD+ 18:9 display - 403 Pixels per inch. Rear Camera: AI powered 12.0MP dual cameras on the rear #1 wide-angled lense f/1.8 with OIS and #2 telephoto lens f/2.4. Now this box. It takes me back to the OnePlus One in a lot of ways, and I say that with the most positive intent. It also stands out amidst all other boxes I've opened lately and it's clear that the makers are proud of this design. It's a clean presentation. The phone lays flat with a charger cable and wall adapter positioned next to it. Hidden underneath it is a small box with official papers, the sim ejector tool and a headphone to USB-C dongle. That's actually a first for me, but I've been using Bluetooth Headphones for 2 years so I couldn't be bothered. Inside the box is also a clean and simple matt black case that is actually really nice and the material kind of reminds me of my Ray-Bans. as a quick comment to OnePlus and Huawei: this is what an included case should look like. Do you save your boxes? answer in the comment section below. Wow. I know the words "wow" sounds silly but this is a really well designed device. Xiaomi moved the camera from the middle to the top left corner and I can't deny the similarities to the iPhone X. But it looks really good, especially with the gold trim. The fingerprint scanner is located as good as can be and I actually enjoy the gold colored "Mi Mix Designed by Xiaomi". I'm not a fan of the C/E branding but at least it's dimmed out and I realize that it has to be there. Booting up, the animation isn't all that good, It's basically the Mi logo followed by the word "Mix" in fullscreen. It's far from the most offensive one I've seen though. Stock Android is gone, Xiaomis skin is called MIUI and is infamously categorized as copying iOS a lot. Now I've previously mentioned that I haven't had any real experience with iOS but from what I can tell the UI is a mix (pun intended) of Android and iOS. There's no app drawer, and I know this is a highly bothersome subject for some but I've decided to keep the stock launcher as long as it's not bothering me. If for nothing else it helps the Navigation Gestures feel even smoother thanks to the home animation closing the app into it's icon. Kind of like on iOS. Now these full screen navigation gestures are great and very fluid. I really like the idea that you swipe in from the sides to go back, there's just one issue: When using the keyboard (Swiftkey) the phone have a hard time differentiation between pressing letters at the outer edges(q,a,z etc.) and wanting to go back. This results in a delay that I haven't seen before and that honestly annoys me. It doesn't seem to be there on the stock Google keyboard though. I'll have to keep testing to see if it's just a learning curve or really an issue. The Recent Menu is horisontal and resembles that of the iOS one. Seeing as Android P is going the same route I guess that's no longer specific to Xiaomi. The Settings menu is also a mashup of of both, but looking at these designs there are only so much you can do to a settings menu if you want to keep it clean. Other than OnePlus and Google, Xiaomis' MIUI is also said to be the smoothest Android interface out there and it shows. Xiaomi started it's operations developing MIUI as a custom ROM based on Android and you can tell that the software is a big focus for the company. It's also interesting that a smaller company manage to change a lot of the stock Android experience while keeping the feeling just as smooth. Whereas Samsung, the Android giant, seems to struggle in this regard. Now there are a few things I've reacted to. Xiaomi includes the ability to double tap the power button for opening the camera but it's buggy. It actually locks the phone on the first tap and then opens the camera. While the screen is off there's also double tap the volume-down button to open the camera which kind of defeats the power button purpose to begin with. I guess this is just an optimization thing as the power button is programmed to react the second you press it, but the implementation becomes strange to say the least. Now why would you want to buy a Xiaomi phone when there are others with the same specs available at home? The price is the biggest competitor here. Well that and the superb build quality and bezel-less design without a notch. The screen is eye capturing and even though this is a 5.99" display it's very manageable. It's not as light as the OnePlus 5T, but as I said in my review that phones felt fragile. I know the Mi Mix 2s won't survive a terrible fall and that that the Ceramic could shatters if dropped, but it still doesn't feel as prone to breaking. And it's definitely not as slippery. But back to the price. At the time of my purchase the 128 GB version was sold for $566(5000 SEK) that's less than half the price on the iPhone X 64 GB in Sweden. It's almost half the Galaxy s9+ and note 8 prices. It's also cheaper than the similarly specced OnePlus 6 that was released recently. And if you ask me this phone looks better than any of those. First impressions of the camera are great. It's a tad better than the OnePlus 5T camera performance and DxOMark gave it the same rating as the iPhone x at 97 points. Xiaomi have confirmed that the Mi Mix 2s uses the same sensors as the newly released Mi 8 and that the software will be updated. If this is true the camera should reach a score of 99 points in total. Xiaomi is marketing it as an AI enhanced dual camera phone and I intend to put it through every day usage of Portrait Mode, Food pictures and Scenery photos in Auto and the AI enhanced mode. The AI mode is supposed to identify about 206 scenes to enhance and "fix" them thereafter by increasing the saturation and such. Here are a few samples from my first usage. Open the images for information. The front facing camera is located different from the competition. Being that the screen goes almost all the way up Xiaomi had to make a choice. The camera is located at the bottom corner of the device. The right corner to be precise. To take a selfie it's recommended that you flip the phone upside down which gives it a more traditional positioning. It's weird at first but it also feels like a non issue and something I'll get used to quickly. Thanks to some software magic it's possible to take Portrait shots with the selfie camera. First impressions are that the quality of the 5MP camera are good, if not prone to some over exposure. I'll have to test it some more. The Xiaomi Mi Mix 2s will be my daily driver for the foreseeable future and in my full review I will touch on the full software, camera and day to day usage experience. I'm also excited to say that I will release an in depth test of the Android P Developer Preview that got released on Google IO 2018 as well as my experience in installing it. It's an exciting time being a nerd.